The other day I was in a store, chatting with a man about his wife’s beloved cat. She had found the cat when it was a kitten, and the two had been constant companions for about 15 years. The cat followed her “mom” everywhere including, on one fateful day, out to her car. Mom didn’t realize the cat was there until it was too late and she had run over and killed her feline friend. The man said his wife’s grief was very great, and she had no way of handling her loss. A kind neighbor took the cat’s body and buried it in his yard. The woman did not go to the cat’s gravesite, nor did she speak of its passing. Three years went by before the woman felt she was able to deal with her loss. The neighbor dug up the box and the woman brought her kitty home. Her husband told me she meticulously cleaned off all the bones, and then painted each of them in a color coordinated pattern so she would know how they all went together. The painted bones went back into the box, and the box went onto a shelf in the closet. We all grieve in our own way. It took several years, but this woman was finally able to find peace with her loss. 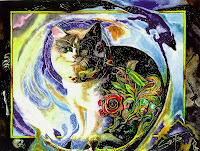 In my heart I think all those painted bones magically found their way to her cat, and somewhere up in the heavens one very colorful angel kitty flies contentedly through the starry skies. Here’s to painting the bones! Oh, my God. I can barely type this through the tears. My heart goes out to this woman. What courage she had to go through that box. I hope she has found peace. It is so hard to lose our fur babies, especially to something so tragic and unexpected. Through my tears, what a wonderful story. We all grieve differently, but it’s the same heartbreaking loss. I am doing much better. My youngest dog Hailey, has so many traits like Kelsey, but so many that are special to herself. Jake is with us in the Ga. Mts. I brought the whole gang from my memorial garden. We are all enjoying the great weather and the beautiful views of the mts.